"Teranet said Victoria’s index fell 3.2 per cent in March, the biggest one-month drop for the city in nearly 23 years of data recording." Indeed we need to put an exclamation mark at the end of that statement. Afterall, Teranet's index is put together by Canadian banks, who, of course, have an interest in keeping house prices high. So far the year to date price drop for Victoria is down -3.20% (to the end of March). 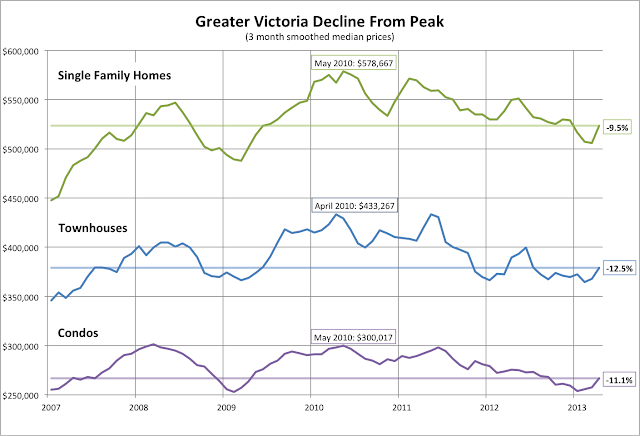 Annualizing that rate puts Victoria's price drop at -12.80% (in one year). Unfortunately Canada doesn't have a completely independent group to calculate price changes in real estate (the US has the Case Shiller index). A Canadian index generated by such a group would be valuable. April's median and average numbers for Victoria went a bit higher. Most of us on this site know that one month's data doesn't make or break a market. 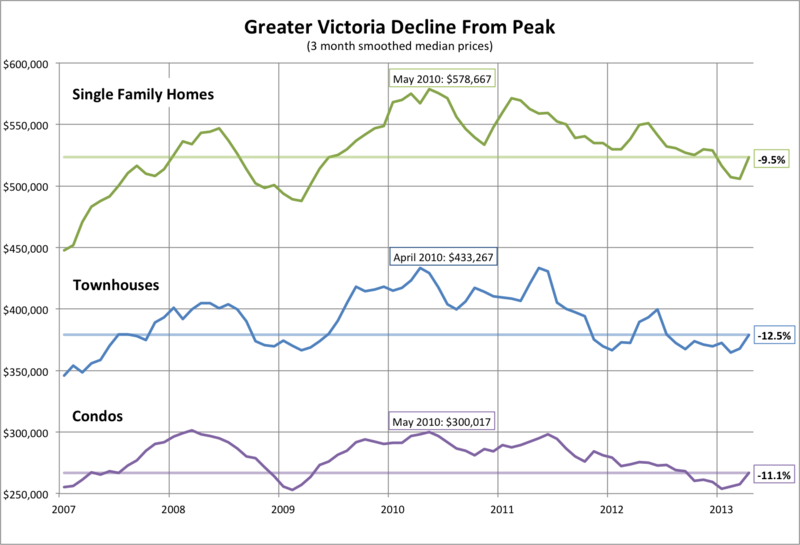 Indeed the median and average have been trending down for all areas of Victoria for many months. This break is normal in a down market. When the median and average numbers for one month jump a bit in a down market it doesn't mean that the market has turned around. More than likely it suggests that, for any given area, the houses that sold were houses that were the most valuable (biggest, best lots, etc.) These houses could have sold for a discount and still pushed the median and average higher for that area, which is what I think happened. April is, arguably, the most important month of the year for real estate sales. It's quite possible that a lot of sales were move-up sales, particularly by owners of average to above average properties moving up to above average properties. Boomers selling their already above average home and buying their dream home would fit into this category. I think April lacked first-time buyers (in proportion to move-up buyers). Afterall, it isn't as easy to get a downpayment as it was before and mortgages are harder get these days (although Canadian household and mortgage debt is still climbing). It wouldn't surprise me to see the median and average numbers for May to be higher than January and February again. This happens virtually every year in Victoria (see Leo's charts from today's post). It would all be perfectly normal in terms of how a bubble housing market systematically deflates. Annualizing that rate puts Victoria's price drop at -12.80% (in one year). You can't extrapolate based on 2 data points. That graph doesn't look very crashy to me. I'm a long time lurker, and have really enjoyed following this blog. Does anyone know how I would get access to longer term data/graphs for Vancouver Island and its sub-regions? thanks. But it's so much fun! Based on the last two points on your SFH graph I predict an all time high for Victoria SFH prices sometime late this summer. I would get access to longer term data/graphs for Vancouver Island and its sub-regions? I only track greater victoria, and have pretty much all available data for that. What regions are you interested in? SE homes in Mount Doug, GH, & Lambrick Park 29 Apri - 5 May 2013, Med Sale Price: $583K. Oh well. Wood framed apartment style condos in the areas of Fairfield, James Bay and Oak Bay have gone down considerably in price in the last 2-1/2 yrs. A nice, 2 bed, 2bath somewhat updated one would go for between $300K-$365K then and now are selling for between $275K & $325K....and still appear to be going down. My extrapolation used 4 data points, including the end of Dec. to the end of March inclusive. The 3-month median for Saanich East is down about -10% from peak. I will provide you with that exact number when I can access it. Hmm. A government org with weak oversight and a mandate to lend lend lend. I wonder how much fraud they will uncover. Up to that point you were the only one to mention the word crashy. Is there something on your mind that you need to talk about? If so, I am here for you Introvert. Nice article about the changing of the guard at CMHC. Maybe its time to drop a CV off to them. Believe it or not, I think the banking industry would embrace tighter policies if those policies were universal. And if OSFI wants to ensure a stable housing market it has to quickly move to reduce the level of home ownership in Canada as well as the total stock of housing. I think a policy of buying up the defaulting mortgages and demolishing those homes might be necessary in several cities through out Canada. Otherwise, we are looking at a glut of housing and much higher vacancy rate than what we have today. As I have said before, it isn't the rise in interest rates that will topple this market - its the leap in the vacancy rate. That has a far more immediate and longer lasting impact on prices than a rise in interest rates. No you didn't. You used 2 data points. The fact that those two points are separated by a few others is completely immaterial. "I only track greater victoria, and have pretty much all available data for that. What regions are you interested in?" I am interested more specifically in the Cowichan Valley, but I'm also interested in trends in other regions. I guess I can piece it together back to 2010, but wondering if there was an easier source, and also one that would go back to maybe 2003, if possible. Only parts of the Cowichan Valley is covered by VREB. Shawnigan, Mill Bay, Cobble Hill and the Malahat. Most of the other areas are covered by the real estate board in Nanaimo. Data for the Cowichan Valley is weak. The Cowichan market is shallow and dysfunctional, You can have multiple offers one week and no offers for months after that. Best to get in touch with an agent that lives and works in the area you are looking to buy. Homes with basement suites in Shawnigan Lake can be as little as $280K. But I wouldn't pay anything more for a suite over a finished basement, the rental market on an annual basis there is just crap. "That graph doesn't look very crashy to me." The national decline is just beginning. What's been happening in Victoria is just a little taste of what's coming. I like the word "crashy". We could also use downsy and upsy or evensy. "In fact, the agency has been at the forefront of changes that made it easier to get a loan, much to the chagrin of the Finance minister, who has expressed concerns about the role CMHC has developed from its historical mandate to advance housing in Canada." Looks like the big F agrees with me. I have some concerns also. "Changes to way the mortgage insurance is administered in Canada are afoot"
This shouldn't be a problem, right? Thanks Just Jack. I'm in touch with an agent, and looking to buy in the fall, unless the perfect place comes up earlier. Looking for house and small acreage. Financially, I imagine it could be better to wait longer, but I don't think that would be great for the family situation. "Looking for house and small acreage." Post some properties that you go look at here and what you think of them. Good luck with your search. Ben is really getting his name out there in front of this crash. I think he'll be labelled as on of the experts who called it early. I have huge respect for Ben. Not only does he do thorough analysis, he can also admit when he has been wrong. the_hypothesis says: "I am a homeowner and I have a 2br apt rented to a nice tenant. Do you know how much money I have to pay just to keep my place ? In between property tax, utility cost, mortgage, strata fees, electricity, gas, water ? I pay up to $1800 a month up-keep for my 2br apartment. Here I am not complaining and happy with the $1300 rent my tenant paid. I am paying a maintenance of $500 every month for my most expensive asset." reply: "That sounds like a really bad investment..."
response: "It's like that everywhere unfortunately..."
Truly amazing logic. It's a terrible investment, but everyone's doing it.."
"The assumption that is made in the case of the normalcy bias is that since a disaster never has occurred then it never will occur." "People also tend to interpret warnings in the most optimistic way possible, seizing on any ambiguities to infer a less serious situation."